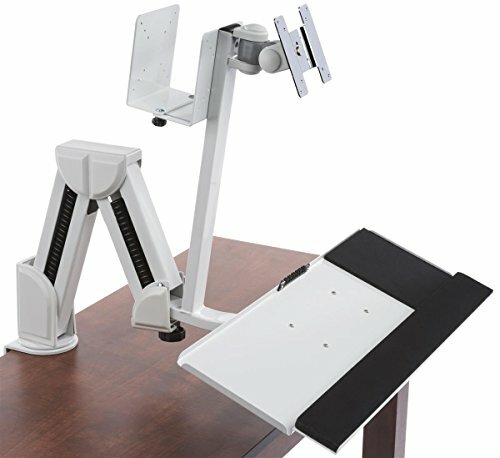 This articulating workstation features an articulating design with a clip-on/clamp style base that mounts computer monitors from 14" to 27" plus an iPad tablet. Attach this ergonomic sit stand display to a desk, countertop or wall and maximize comfort and health. Enjoy panning, rotating, and tilting capability with this flat screen and tablet holder that is viewable in portrait and landscape orientation. The computer trolley is height adjustable from 27.5"h to 30"h. This work station comes with an adjustable CPU holder, keyboard tray, wrist rest and mouse pad.